Imagine that you enter your home late at night after a grueling day of back-breaking work. You proceed to have food at around midnight and right at the time, when you think that you will find some solace in food, you find a boring table awaiting you for dinner. How would it feel like if it really happened to you? What? Does it actually happen to you every night? If yes, then please go ahead and buy a new dining table for your home. 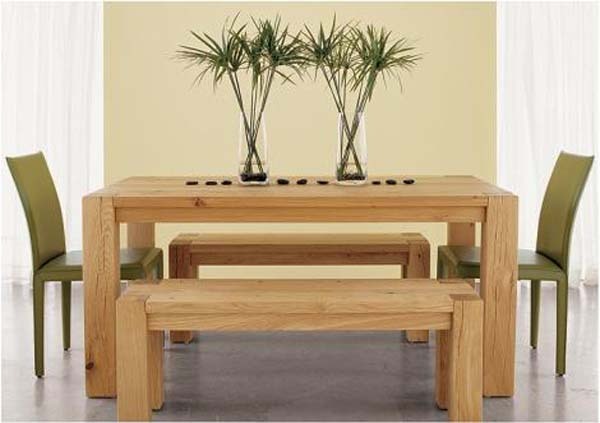 But it is really not easy to find out what kind of dining table will look good in your home. 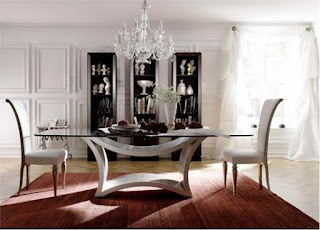 Moreover, dining table must be such that it accentuates the beauty of the interior design of your home. Dining tables are no longer considered just an ordinary piece of furniture. They can be as elegant and as stylish as a furniture piece can be. 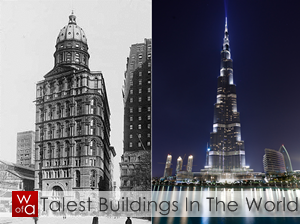 And designers across the world have come up with amazing designs of dining tables. Let’s sit together with a few designers for dinner tonight on 12 stunning dining tables from around the world. This dining table from Draenert is a kind of a multi-functional piece of furniture. The table pulls apart from the middle and thus, it makes room for a stroller to arrive at the desk from the kitchen or to hold items like champagne bottle or a cutlery box. This way it creates more space to have dinner and more space to hold utensils on the desk, which is a challenge we face many a times in our homes. This dining table has been made out of natural stone, MDF-Veneer and with its natural look adds a magical touch to the interiors of the dining room. The interior design and furniture firm, Arredamanti Diotti, has come up with this unique design of dining table for your home. 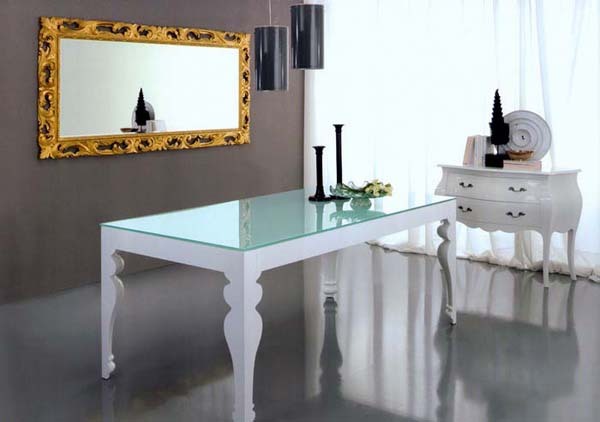 The dining table has a glass surface, which makes it quite easy to avoid stains and be cleaned regularly. 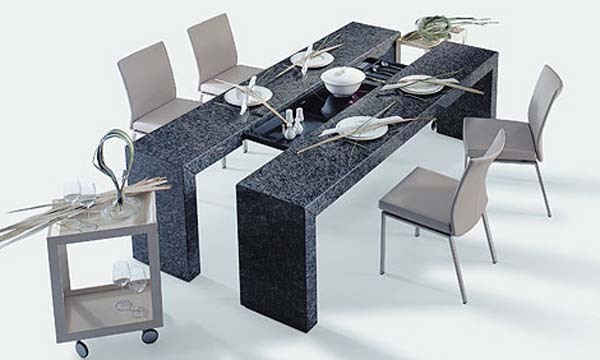 The dining table is available in two colours, viz. back and white. At once classic and modern, the Tavolo dining table has a wooden lacquered structure in black and white colour, which is then covered with black or white tempered glass. The heaving lines on the table’s design make it look classic and modern at one go! This is one dining table that will suit the corporate offices and formal dining places. However, if you have to add a majestic touch to your home, then you should bring this table to your abode. 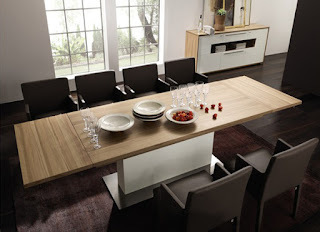 The table named Action, is covered with satin steel and the extensible glass top makes it easy to accommodate 10 people. The table is available in a variety of finishes and there are variations in the design and shape of the legs and the surface. You can opt from a wide range of options for the table, from oak to wenge, from satin steel to white or black glossy lacquered and leather cream in colour. The surface looks awesome in silk-screened tempered glass in colours of black, white, extra white and coffee. 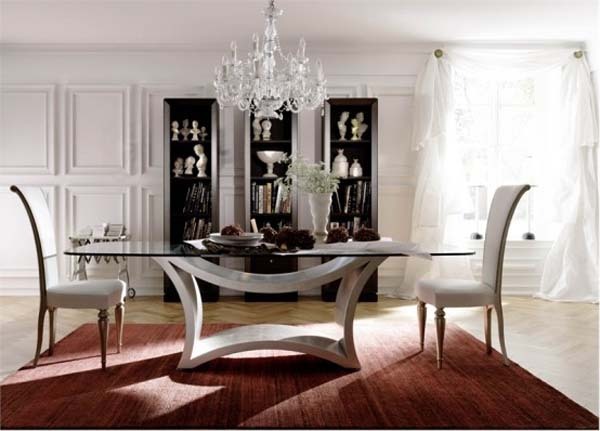 The Italian furniture company, Selva, has come up with this astonishing design of dining table for its Tzsar collection. The table has a frame veneered in cherry and is adorned with a tempered glass top. The spectacular sheet underneath the glass surface is best viewed and emphasized by the transparency of the glass surface. Use of high quality materials to make this table makes it one of the most desired dining desks in market. Along with good quality chairs of suitable shape and design, this dining table will be a great match for your home. Don’t be scared of the name. Cattelan Italia has come up with this amazing design of a round table for dinner. The clear glass top, combined with a frosted lower glass top, make the design look graceful. The colours of the legs are natural beech or walnut, cherry wood, wenge, silver and black stained beech. Round tables are perfect for rooms that have less space and for homes that have less people dwelling in them. Make way for the chic dining table from Crate and Barrel. The Big Sur Dining Table brings long with itself an aura of relaxation and peace. The amalgam of rustic natural wood along with its heavy appearance adds a sense of sturdiness in the dining room. The dining table is perfect for those who want to convey authority and for those who need the reassuring presence of the table in the home. Let’s return to style and black! And let’s bring to your home a mark of sophistication in the form of The Trend dining table, which has been designed by Compar. With its luxurious finishes and meticulously designed lines, the table weaves magic during dinner with its transparent glass top. And if you peep from the glass, you will find faux crocodile skin-covered legs that take you close to the nature while dining. Don’t worry; we have not harmed crocodiles for this. But in case you are sceptical, then you can instead opt for a black lacquered metal base. Yes, it is different from The Tavolo that we had dinner on a short while back. 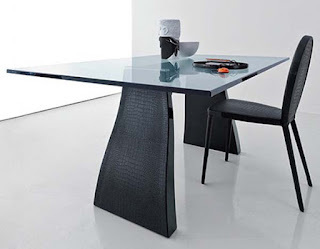 Designed by G Carollo for Porada, an Italian company, the table has a leather covered base and transparent glass dining surface. It is bound to cast a spell on the diners with its unique one piece base and modern shape. The design is indeed minimalist and it will certainly add elegance to your home. It is again time for titans to return. 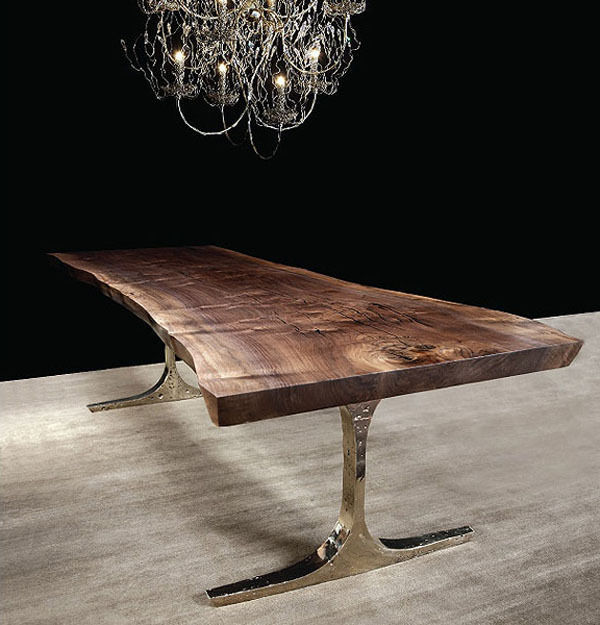 This high-end dining table has ample space for a number of guests. Created by Hulsta, the table has an extensible wooden surface that rests on a foot column. The foot column conceals the extension leaving behind a small door for the curiosity of your guests. We are sure that you must have loved the idea of the round dining table. Well, let’s see another round table, called The Samburu. This table, again from the home of Porada, was conceptualised by designers named M. Marconato and T. Zappa. 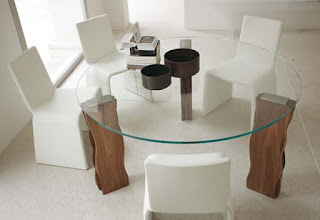 Walnut makes up the four legs and the undulating shape makes the table look futuristic. The wooden legs balance the glass top surface very well and this makes the table look approachable with its minimalist design. The best way to have dinner is to experience night along with the taste. This furniture from Hudson Furniture has a handmade cast bronze base and semi-finished walnut top. Because of the emphasis on the dark lines running through the table, the furniture looks quite natural and looks as if it has been placed just after felling a tree. This design from the house of Gessi has a kitchen faucet attached to the table. 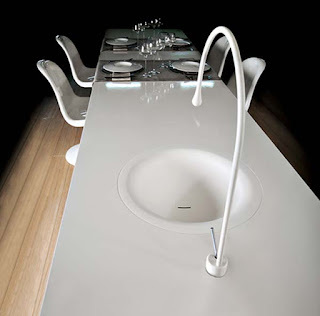 This table is multi-functional and the integration of the faucet along with the large table makes it a perfect choice for small places where we need to accommodate multiple things at one place. This ends our journey for 12 amazing dining tables. Now, it is your turn to decide which one you are inviting for dinner today forever.